More than 30 ordained Sangha attended the recent Light of the Path retreat with Lama Zopa Rinpoche. FPMT’s Sangha community, which comprise the International Mahayana Institute (IMI), has played a crucial role in the development of FPMT. To recognize this contribution, FPMT celebrates International Sangha Day on July 31 this year. This is the twelfth year of honoring Sangha with a special day, which falls on the Wheel Turning Day: Choe Khor Due Chen – The First Turning of the Wheel of Dharma. 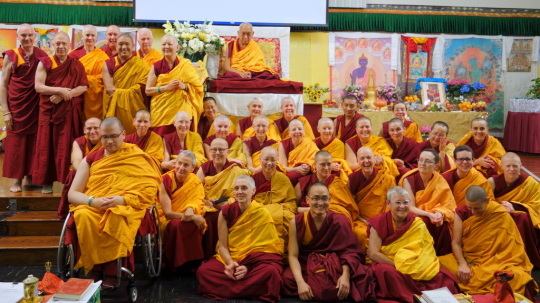 From the early days of the FPMT, monks and nuns have served tirelessly to help bring the benefit of the Buddha’s teachings to the far corners of this planet. 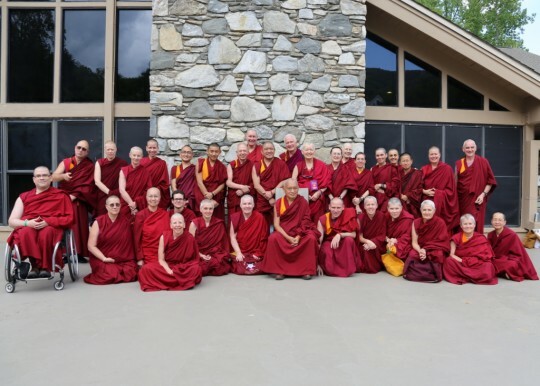 The IMI community has approximately 280 monks and nuns who continue to serve throughout the FPMT in many capacities as registered teachers, directors, spiritual program coordinators, editors and more. Many of these Sangha members are able to attend retreats with Lama Zopa Rinpoche due to the support of the Lama Yeshe Sangha Fund and IMI.